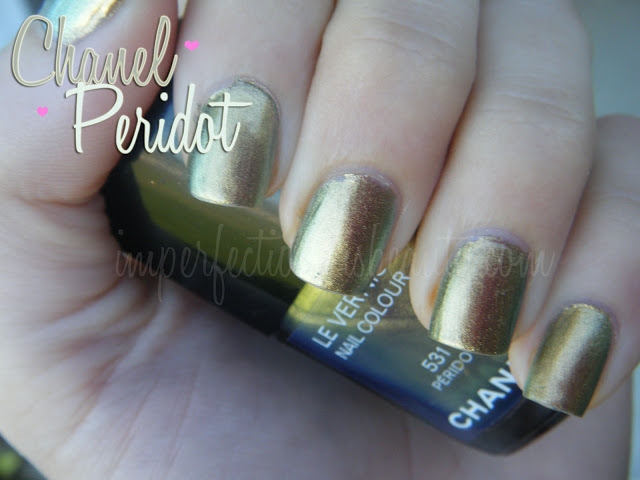 Chanel's Peridot is one of Chanel's most buzzed about colors from their fall 2011 collection. Usually I don't really feel the need to splurge on to many Chanel polishes only because usually they're are just so many dupes for a quarter of the price. However when I first seen this color I knew it would be hard to pass up because how unique and gorgeous it was. At first I was a little hesitant of this polish the first time I wore it and really wasn't feeling it. In natural light it pulls a little more metallic, as for night it gravitates more green. It definitely grew on me because now I actually really love it! My fiance even commented on how much he likes my nails lol and he never really pays attention to my nails to much. Its the perfect iridescence shade and really glams up my hands, I can't stop looking at them. I've heard that Sephora's Diving in Malaysia is a great dupe to Chanel's Peridot although, I do not have the Sephora color I did Google it and it does look super close, but the Chanel color pulls a little more green as the Sephora polish pulls more towards the gold. 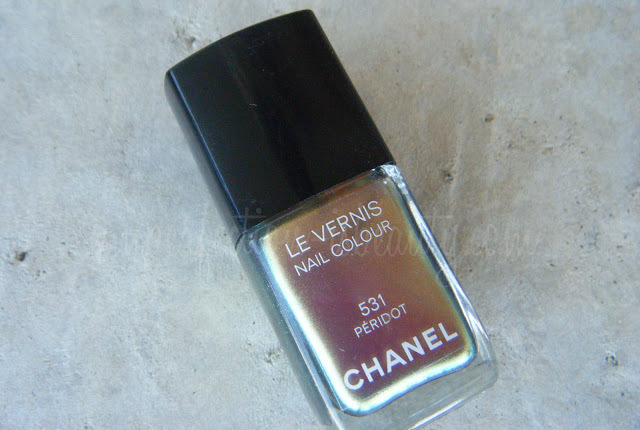 If I were to describe this Chanel's Peridot it would be: metallic goldish, green with a tiny hint of teal/blue (I don't see any blue on my nails but in the bottle you can see some blue tint). Pictures do not do this polish any justice. Its hard for me to get all the colors. In the right light you can see gold on one angle, and green on another angle. 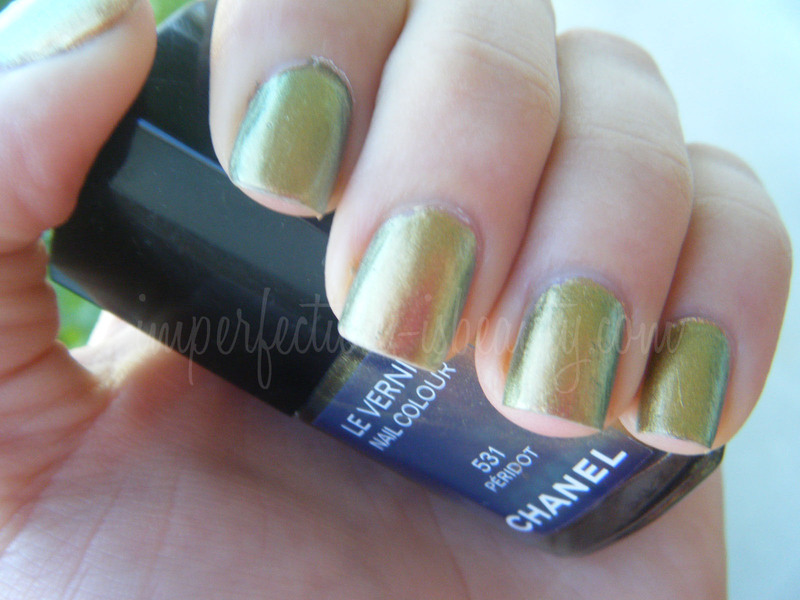 Overall the color pay off of Chanel's Peridot is super rich. The formula is on the thinner side although, it is the least bit sheer, its super shiny, and glossy. One coat was pretty opaque however, I always like to apply two on the safe side to get its full impact. Chanel's polishes for me are not very long lasting, I'm crossing my fingers this formula will be a little better considering the price. This color is limited edition and when it first debut it was sold out everywhere. They're still selling this on Chanel's website. Peridots definitely a Fall favorite of mine. Have you tired this color? Would you wear this? oh this shade is so pretty, perfect for fall! omg i didn't realize the iridescent effect on this nail colors. spot-on, Chanel. that nail polish is amazing! i have got to get me some of that!!! wow thats so pretty, i have never seen a polish that looks that way before. i think i need to go check it out. WOW!!! that color(s) is absolutely gorgeous! !